Looking for a good way to finish out the 2010 crawfish season? How about a big crawfish boil party? 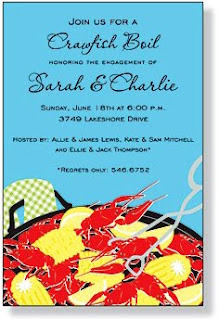 Invite your friends and family over to celebrate the last bit of yummy crawfish available for this crawfish season with one of these festive invitations. The Louisiana crawfish season typically starts in early spring. The peak season runs from March through June, but these dates change depending on the weather each year. With the slow start to crawfish season in 2010, big tasty crawfish should be available all the way thru June. So now is the time to get your crawfish before you have to wait until next spring! Did you know this interesting fact about crawfish? According to Stephen Minvielle, director of the Louisiana Crawfish Farmers Association*, Crawfish are the safest food people can eat in Louisiana. He said, “They are non-tolerant to any chemical — pesticides or herbicides.” One more reason to cook up a batch and celebrate the end of the 2010 crawfish season. The fun crawfish boil invitations highlighted here authentically capture the spicy cajun specialty perfectly. These custom invitations are printer friendly and sold blank. This means that you can print directly onto the blank card from your printer at home, saving you money. In addition, quantity discounts are available on most of the invitations.So whether you are sending out 10 or 1000 cards, save money by buying your crawfish boil invitations from Mardi Gras Outlet. Standard letter paper that can be used for invitations, newsletters and scrapbooking is also available in crawfish boil patterns. This economical paper is another great way to send out traditional invitations but the lower price per piece helps to cut costs. This is a great way to save money if you are hosting a large crawfish boil. For other ideas on inexpensive table centerpieces for large crawfish boil parties, see our post on Crawfish Boil Centerpieces. Don't forget the rest of the crawfish boil supplies you will need from Mardi Gras Outlet. Disposable paper crawfish trays make serving the crawfish easy and clean-up a breeze! So grab some of your favorite cold ones and enjoy some crawfish!